HANDROP DIGITAL – MC 8 and 12 channel variable volume digital pipettes with digital display. Precise volume selector. Easy calibración and maintenance. Lightweight and ergonomic design with tip ejector. Pasteur pipette of code 27054 has a capillary tip of polyethylene. 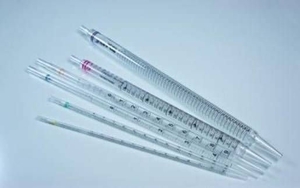 Polyethylene Pasteur pipettes of code 27054, 27055 and 27051 has capacity 1, 3 and 1.5 ml respectively with the last one of length 230 m.
A pipette is an instrument for taking a sample of a liquid. These devices are widely used in medicine, including in laboratories performing biological analyses, cytological studies and many other settings. Pipettes differ in their capacity and precision. While graduated models are the most common, Pasteur pipettes are usually favored for very small quantities. Mechanical or electronic types are often used to obtain a very precise quantity. Some have a fixed volume. Others allow the amount to be selected before use. Choice will naturally depend primarily on accuracy. Other factors include ease and speed of use.